Keywords: Docking, conformational energy, heatmap, PCA, Lipid II, potency. Keywords:Docking, conformational energy, heatmap, PCA, Lipid II, potency. Abstract:Background: Lipid II, a peptidoglycan, is a precursor in bacterial cell synthesis. It has both hydrophilic and lipophilic properties. The molecule translocates a bacterial membrane to deliver and incorporate “building blocks” from disaccharide-pentapeptide into the peptidoglican wall. Lipid II is a valid antibiotic target. 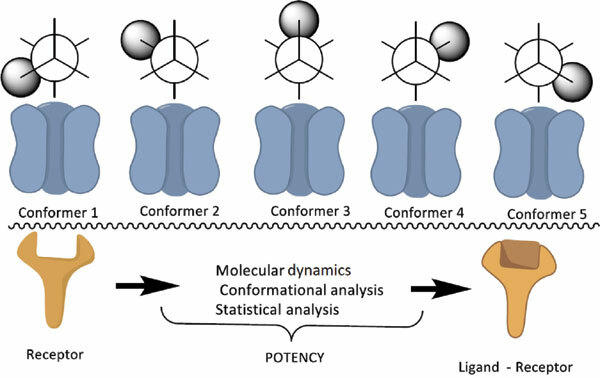 A receptor binding pocket may be occupied by a ligand in various plausible conformations, among which only few ones are energetically related to a biological activity in the physiological efficiency domain. This paper reports the mapping of the conformational space of Lipid II in its interaction with Teixobactin and other Lipid II ligands.